Yahoo CEO Marissa Mayer helped design some of Gmail’s features while she was a top executive at Google Inc. Since its debut nearly a decade ago, Gmail has grown into the world’s most popular email service. Yahoo Mail now promising 1TB of storage space on each account for mails and attachments and other content. Yahoo had earlier announced 1TB of free storage for Flickr. The new Yahoo Mail is available across platforms including Windows 8, iOS, and Android. 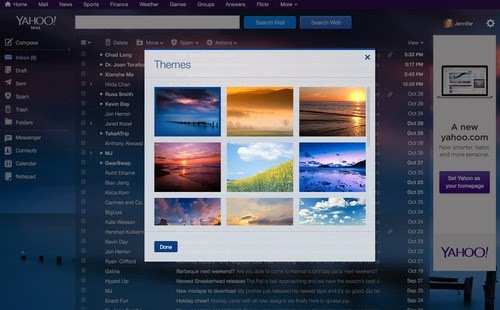 In terms of the redesigned UI, Yahoo Mail has been made better with easy to access features and new theme based interface. When you hover on top of a mail in the inbox, you will see three options including search for more mails from the sender, deleting the conversation and starring the mail. These one tap options work similar to what you get in Gmail. Apart from this, The company also introduced new features previously reserved for premium Mail Plus users like disposable email addresses, enhanced filters and automatic message forwarding are now available for everyone for free. Besides this,Yahoo is also introducing the ability to change your background across all your different platforms. you can add new themes including photos from Flickr account. The theme you pick will follow you from the Web to your devices as part of Mayer’s efforts to maintain consistency across platforms.Yahoo has also tweaked the mail interface and added conversations-based threaded view for emails, which is now a regular feature for most mail services. Yahoo has also mentioned that the new Windows 8 experience is available only in English in India and other countries like the US, Canada, UK, Philippines, Malaysia, Ireland, New Zealand and South Africa. Yahoo Mail might not be the transcendent e-mail experience required to slay Gmail, but it’s a huge move in the right direction. Posted on October 10, 2013, in mail, new yahoo mail UI, news, yahoo, yahoo mail 1TB storage, yahoo mail updated and tagged Blogger yahoo mail 1TB storage, IFTTT, mail, new yahoo mail UI, news, yahoo, yahoo mail updated. Bookmark the permalink. Leave a comment.